Center-Pull Towel Dispenser offers roll control so you pull off a towel from any angle. Multi-angle towel detaching system minimizes roping and streaming, and maximizes hand dries per case. Hands touch only the towel used so the dispenser allows hygienic dispensing. 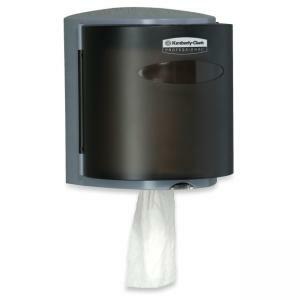 Towel dispenser holds Kimberly-Clark Scott Roll Control Center-pull Towels with patented absorbency pockets.